It's about time I introduced you to the quintessential Persian side dish, sabzi khordan. What it is, is basically an assortment of different herbs trimmed, washed, and beautifully arranged on a platter. 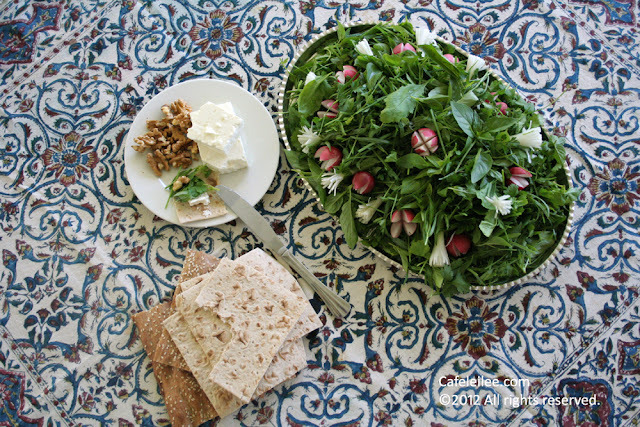 It is eaten as an accompaniment to many Persian dishes and sandwiches. I have given a sneak peak preview of it on couple of my previous posts here and here. Beside being a side dish, sabzi khordan also serves as a very nostalgic breakfast or afternoon snack. Wrapped in Persian flat bread along with some feta and walnuts, the herbs makes for a very refreshing snack after a siesta. 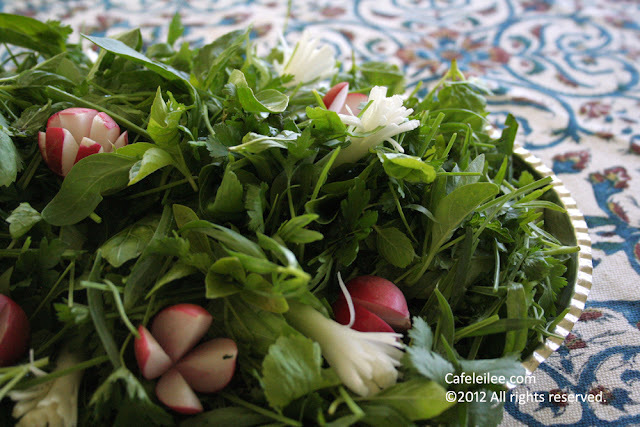 To prepare sabzi khordan, it's better if you use the Persian equivalent of most herbs like parsley, basil or mint. 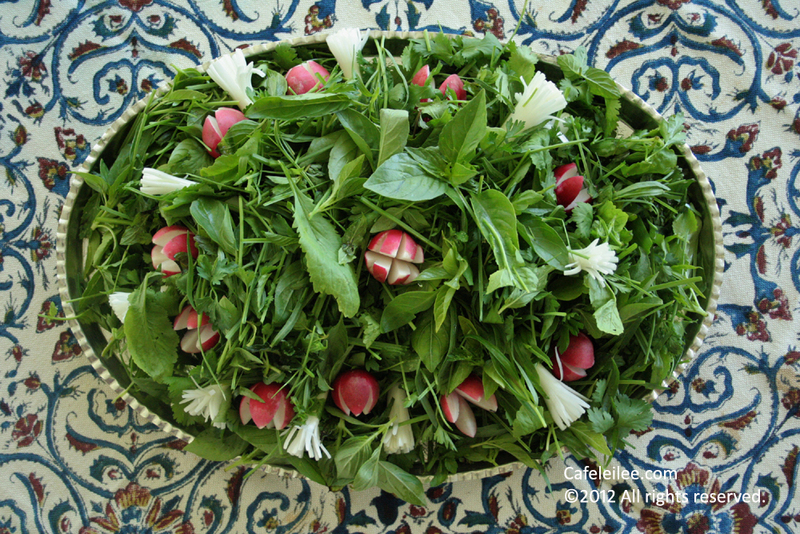 Persian herbs are more tender and smaller compared to their Western counterparts. You can purchase Persian herbs from most Middle Eastern stores. Remove the tough stems and any yellow part of the herbs. Remove the green parts of the green onions and leaves from the radishes. Cut four slices into the radishes from tips to about 1/2 inch of the bottom so the four slices remain attached. Depending on the size of your green onions cut 2 or more slices into the green onions about 1/3 of the length. The more cuts you make in the green onions the more beautiful it'll look. Soak all herbs along with radishes and green onions in a very large bowl with plenty of water for about 20 minutes. You need plenty of water and room in the bowl so that the herbs rise to the top and there is room for the dust and mud to sink to the bottom. Gently transfer the herbs to a colander without disturbing the water. Rinse out the water and clean the bowl. Repeat the soaking and rinsing step until there's no mud at the bottom of the bowl. The segments in the radishes and green onions will open up and start to look like florets. Spread the herbs on a clean towel and let them dry. Arrange on a large platter and serve.